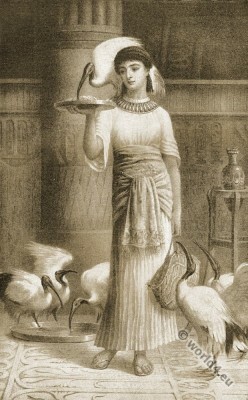 Home » Alethe, Priestess of Isis. The Epicurean, by Thomas Moore. The Epicurean, a Tale by Thomas Moore. Thomas Moore’s “The Epicurean, a Tale.” 1827. Edwin Long, Artist. E. G. Heater, Engraver. Thomas Moore (Irish Tomás Ua Mórdha; 1779 – 1852) was an Irish poet, writer, translator and ballads singer. Thomas Moore is often called the Irish National Poet. This is mainly due to the Irish Melodies, his most famous work cycle. Moore Irish Melodies let Ireland appear in a harmonious, romantic light, far from all acts of violence and political conflicts of the time. This earned him a lot of criticism. Conservative critics in England felt Moore could instigate with his works an uprising against the English Crown. Poems by Thomas Moore were set to music by several composers, they include Gaspare Spontini, Robert Schumann, Hector Berlioz, Charles Ives, William Bolcom, Lori Laitman, Benjamin Britten and Henri Duparc. The poetical works of Thomas Moore, including the “The Epicurean.” By Moore, Thomas, 1779-1852. About “The Epicurean, a Tale.” The Eleusinian and Bacchic Mysteries, by Thomas Taylor. Alethe, Priestess of Isis. The Westminster Review. Baldwin, Cradock, and Joy, 1827. The Casket, Or, Flowers of Literature, Wit & Sentiment. Atkinson & Alexander, 1827. This entry was posted in 1827, 19th Century, Ancient, Egypt, Fantasy costumes, Genre, Middle East, Romantic Era and tagged Ancient Egypt clothing, Artist, Character sketches on 9/3/15 by world4.